Outdoor Leisure SH36208 Smoke Hollow 40-Inch Barrel by Outdoor Leisure at Freedom from Government. MPN: SH36208. Hurry! Limited time offer. Offer valid only while supplies last. Outdoor Leisure Smoke Hollow 40-Inch Barrel Smoker comes equipped with 720-square inch of cooking area and you can use charcoal or wood to cook. 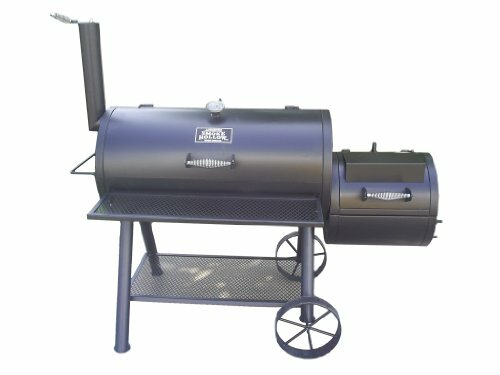 Outdoor Leisure Smoke Hollow 40-Inch Barrel Smoker comes equipped with 720-square inch of cooking area and you can use charcoal or wood to cook. There is a 40-Inch by 20-Inch barrel with a offset fire box. Porcelain coated heavy-duty cooking grids. This unit has a wire mesh front table and a wire mesh bottom shelf. If you have any questions about this product by Outdoor Leisure, contact us by completing and submitting the form below. If you are looking for a specif part number, please include it with your message.